Do your screen doors hang low? Do they wobble to and fro? People forget how important of a factor a hinge is to a door’s success. Many screen doors have only three hinges. Over time and with continued used, those three hinges just do not hold up. You can see the results – doors falling off the hinge, not closing properly, letting in bugs and looking unsightly. 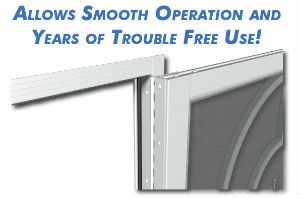 No one wants an ugly screen door hanging off its hinges on the front of their house – or even their back door. It lowers property value. A full-length, continuous piano hinge helps the door hold tight – and adds curb appeal – for years and years. With the current economic climate, people want to invest their money in a product that will last. It is also a competitive market, so it’s more important than ever for contractors to offer not only quality work, but quality products, as well, to keep and develop current customers and find new ones. You’ll have fewer call-backs if you install a durable screen door with a full-length piano hinge that allow years of smooth operation and trouble free use. Homeowners want to add curb appeal – not take it away! Learn how you can offer your customers quality screen doors that will add beauty to their homes. Visit our contractors portal for more information.